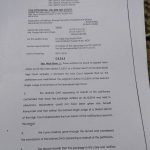 The complainant who is based in Saudi Arabia, submitted an application to the Wafaqi Mohtsib, stating that his father was working in Gujranwala Electric Power Company (GEPCO) as Line Superintendent, when he died on 04-04-2014. 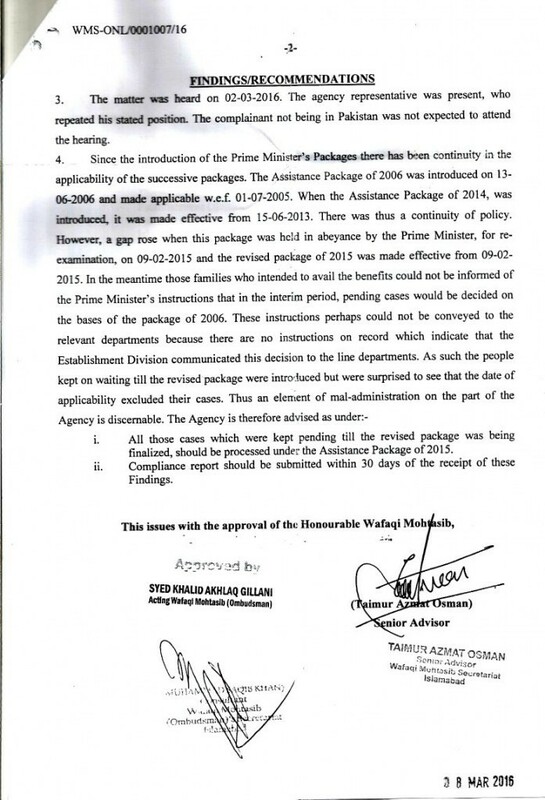 At that time, the Prime Minister’s Package for families of Federal Govt Employees who die in service, of 2014 was in vogue. 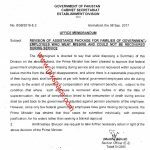 On 02-10-2014, the Prime Minister held this assistance package in abeyance and notified a committee to review the Package. The Revised Assistance Package was notified on 04-12-2015. However its date of effectiveness was with effect from 09-02-2015. In view of this their family was excluded from any assistance package. Hence the cause of the complaint. 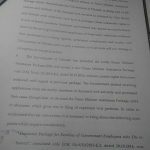 Other details can be read on the copy of the decision. Special thanks to Mr. 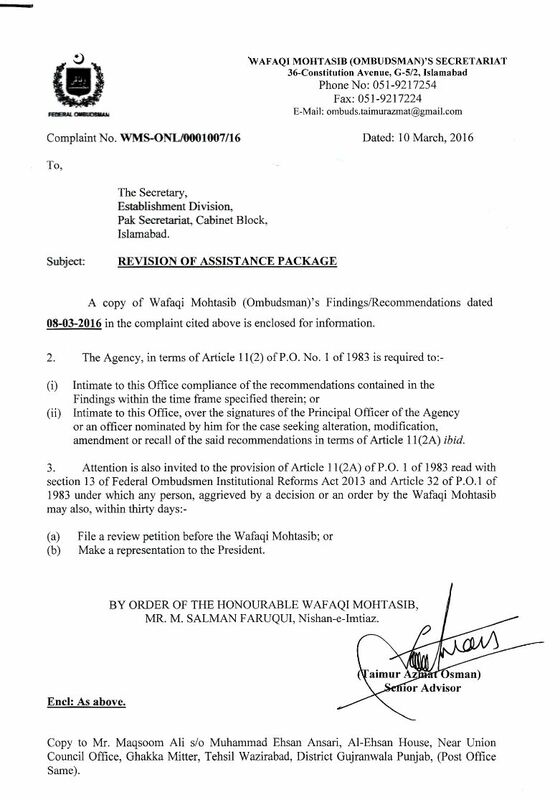 Engineer Maqsoom Ali Ehsani for sending the copy of the orders. A valuable Whatsap group Is Created For All effected Families Named As Assistance Packager 2014. You are Advised to join this groyup Simply my Texting me at my number I will Add you as a Member Of this Group. You Will Easily get Each And Every News. Take it Seriously This is For you. Respected Mam, My Father was a federal government employee.He died on 26/01/2015.At that time the assistance package of 2014 was applicable but soon after few days you know it was put to abeyance.And after much time the revised package came and applicable from 09/02/2015.The office is implementing a Package of 2006 on us as the revised package says.Shouldnt we given a 2015 revisef Package.Please Inform or i should Contact Wafaqi Mohtasib. As sama as my case and same department any progress? My father was a Gazetted offices BS(17) in PTCL, he died last year during service, Please let me know that are we eligilble for the PM Assistance package. Dear madam mary father ki 2011 ma during service death hui thi jo k Iswlamabad ma ak semi govt Organization ma job krty thy. 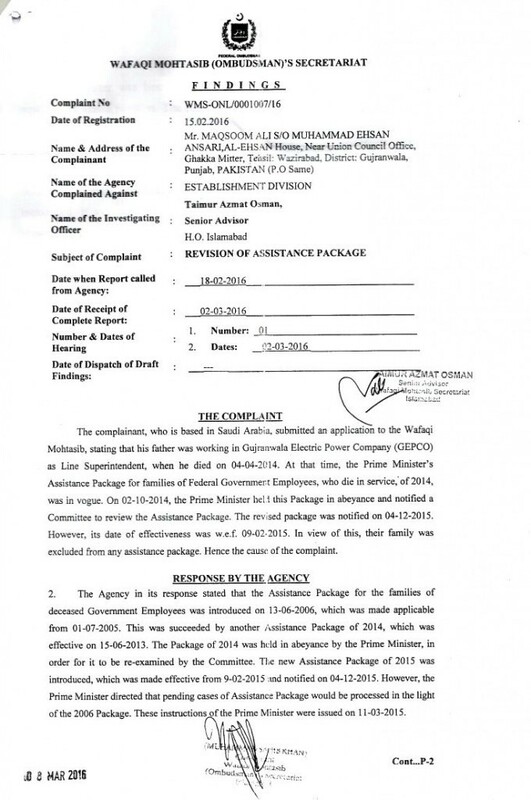 un ki death k bad mjy un ki jega PM Assistance Packege k tehat 2year contract per appoint keya gya tha jo k time to time extend hota rehta hy.mujy abi 5 sal hony ko hain magar mujy regular ni kr rhay. 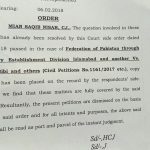 madam kya asa koi notification or Court order hy jo mary lya helpful ho. ap mari help kr sakti hain mjy koi Notification ki copy provide kr dain. dear sir/mam PM assistance package ZTBL (zarai taraqiati bank ltd) employe ky liay h ka nai? 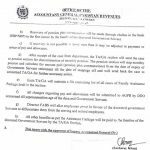 zarai taraqiati bank employ include in pm assistance package? Aslam-o-Alikum! I would be very thankful to the one who will inform me about the present status of Deceased Employees Family Package 2014 revised by Wafaqi Mohtasib and establishment appeal. Mere father ki death 2nd May 2016 ko hoi but office walon ne mujhe PM package ke tehet abi tak job nai di. Mere father court main kam karte the. Ap guide karain ke mujhe kia karna chaie maine application forward ki ha office main. Mujhe baqi sab benifits mil gaye hain sirf Job ka nai hoa please guide. Dear sir kindly advise.my father was ptcl in 17 grade he died jan 29 2006 . My mother getting pension from ptcl ..i want to get a pm assitancr package please advise for the procedure . Dear Galaxy world meray father ki 1995 mein during job death ho gae thi. Kya mjhy ab assistance package k through job mil sktiii ha? by the grace of God your efforts will be highly appreciated. Ab ye revised assistant package ka notification kab issue ho ga....please help me?. Dear Madem Sahiba please hama ye batawo k me father 23/02/2015 ko fout ho gia ta.awr wo central govt me dispenser ta.tu FATA Directorate wala kahta hain k hamara pass revised assistance package ke notification nahi ayee hai.please abb hum ne kia karnee ha....please inform me. 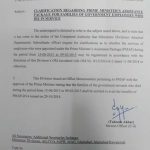 Dear Sabil nawaz new revised Notification is not issued. Madam u r doing wonderfull job for public servants. Thanks Dear Muhammad Saeed for appreciating my efforts.